Some may argue what made The Black Beauty unique to TV viewers was its wide array of lights, gadgets and crime-fighting equipment. Although the impact of these features was sometimes augmented by special effects, most were fully functional on the car. Presented here, in no particular order, are the many attributes of The Green Hornet's rolling arsenal, The Black Beauty…"Let's roll, Kato!" The Black Beauty has a total of six separate headlights, with a maximum of four in use at any one time. The headlights are capable of revolving to reveal either one or two lights per side. One set might be called the �standard white incandescent style", of which there is one light per side, sometimes used as a spotlight feature. The second set, two lights per side, are referred to as the Infra-Green Headlights. This name was best explained in the novel, "The Infernal Light", by Ed Freind. There Freind described the light as being something that only The Green Hornet and Kato could see thru special lenses in the eye cut outs of their masks. Infra-green was supposed to be a wavelength akin to infrared, which provided them excellent vision in low light conditions. Of course, there is no scientific basis for this assumption, but nonetheless the effect is as described. Kato's pull-down "Infra-Green" visor worked in combination with The Black Beauty's Infra-Green headlights. It enhanced Kato's mask filter's capabilities as well, greatly aiding him in his night driving duties. A total of sixteen front rockets, eight per side, are located below the headlight area. Upon activation, hidden doors open electronically to reveal one of the most often used weapons in The Green Hornet's arsenal. On the set, stage pyrotechnic experts would load the rocket tubes and fire them remotely. This was handled separately from other aspects of production, in order to keep the actors safely out of range while filming the explosion effects. NOTE: Vintage pre-production photographs show the front rockets in an "X" formation (two banks of five rockets). The rear rockets have been seen in various configurations, but on TV only the "X" formation style was utilized (ten per side in two banks of five rockets). NOTE: Vintage photos show one Black Beauty with the rear rockets in a "round" formation style (two banks of four rockets each). A front firing "gun" was used to dispense non-lethal Hornet gas. 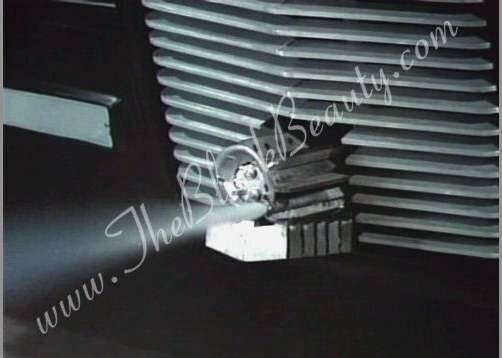 Based on the gas gun's nozzle, it appears to have been capable of other effects as needed during production. However, no other effect was ever suggested. Located inside the trunk of the car, atop an electric lift, the scanner would rise on command through double doors in the trunk lid. In the TV series, it was capable of flying high above the city, looking down to film areas of interest. Much like predator drones of today. Located inside the trunk of the car, atop an electric lift, the Mortar would rise on command through double doors in the trunk lid. 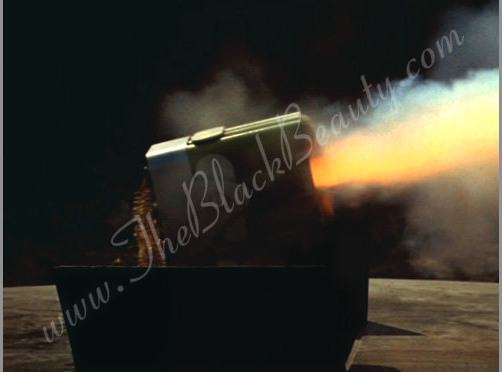 Seen in only one episode, �Freeway To Death�, it was used when the rockets were not sufficient to disable several bulldozers. NOTE: The Mortar was a pyrotechnic-loaded effect that proved difficult to use. Since the unit was larger than the double-door opening would allow, it is entirely plausible that a mock-up of the car's deck was used for this particular firing sequence. During the daytime, Britt Reid�s leisure car (a 1966 Chrysler 300 convertible) occupied the only space in his garage. In order to have The Black Beauty hidden from prying eyes, it remained suspended beneath the floor that the convertible occupied. 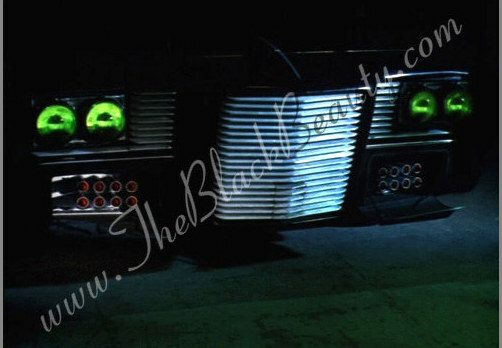 Whenever The Green Hornet and Kato needed The Black Beauty, they would access a hidden control panel in the garage to activate the floor turntable. On both The Black Beauty and the Chrysler 300, protruding rams extended out of each corner of the cars. Bracing clamps locked onto the rams and held the car in position in preparation for the floor's rotation. Once the turntable stopped, and The Black Beauty was at street level, the clamps would release and the rams would then retract back into the body of the car. NOTE: While the protruding rams on The Black Beauty are real, the on-screen effect was achieved by using smaller scale models of both cars. Talented designers from Aurora Modeling Company built the miniaturized cars for filming the "turntable" sequence. Aurora provided their services in exchange for a licensing agreement to produce and market The Black Beauty styrene model kit. Aurora's popular kit was sold throughout the U.S. during the late-1960s. Standard early design mobile unit for making and receiving telephone calls. A VERY big deal in the 1960s! 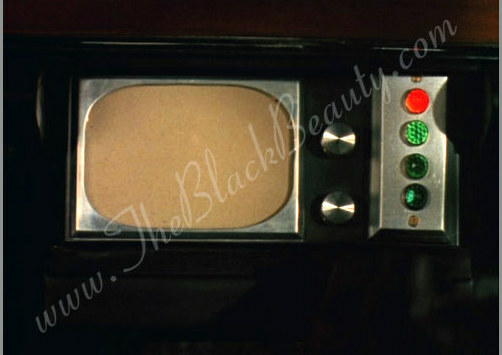 Although the front TV screen was accessible only by Kato, it was sometimes seen in episodes being used by The Green Hornet. 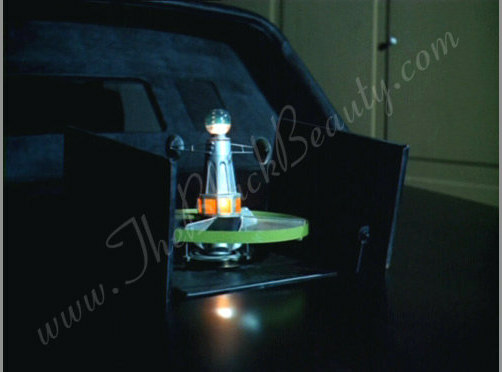 Located in the front dash, it was capable of displaying images beamed to it by the scanner. 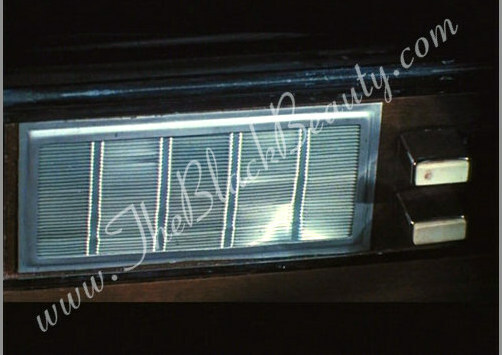 The front dash speaker was capable of receiving transmissions from The Green Hornet's watch microphone and other bugging devices. 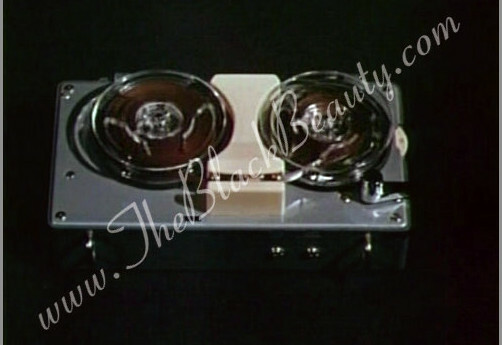 It was also shown to be used in conjunction with The Black Beauty's onboard tape recorder (pictured below). 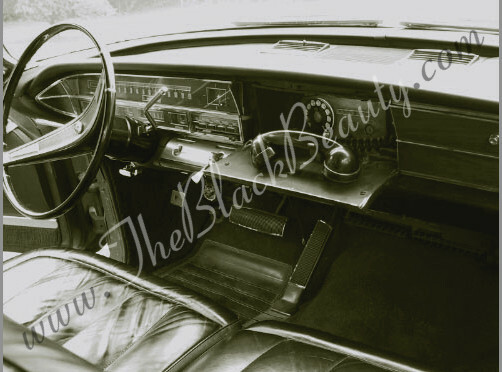 The Black Beauty's onboard tape recorder.